It acknowledges those personnel on current crewmember or non-crewmember flying status that requires them to participate in aerial flight on a regular and frequent basis in the performance of their primary duties. 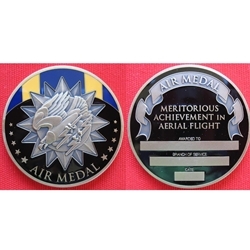 Presented by all branches of the Armed Forces of the Unites States, the Air Medal was established by order of President Franklin D. Roosevelt in 1942 and designed by Walker K. Hancock. This coin commemorates the brave and steadfast service of America's men and women who take to the skies in defense of liberty.